What's your favorite copper fouling remover? I've repeated this test with Hoppe's #9, Bore Tech, and Barnes CR-10 with similar results. The KG products are amazing. I've recently been using JB Bore Paste every now and again too. My problem with the Wipe Out type cleaner, is that you have to "let it sit" for a while and then come back and finish. Or that's the way it was explained to me, and while I'm sure it works great, I just don't like that concept. I want to get it done and be done. Wipeout is probably the fastest, but may leave a little behind. I understand the "get'er dooonnne' approach, but cleaning is an ingrained ritual with me. Even if I use the Wipeout, I still spend an inordinate amount of time, and DOZENS of patches... might as well use the KG. 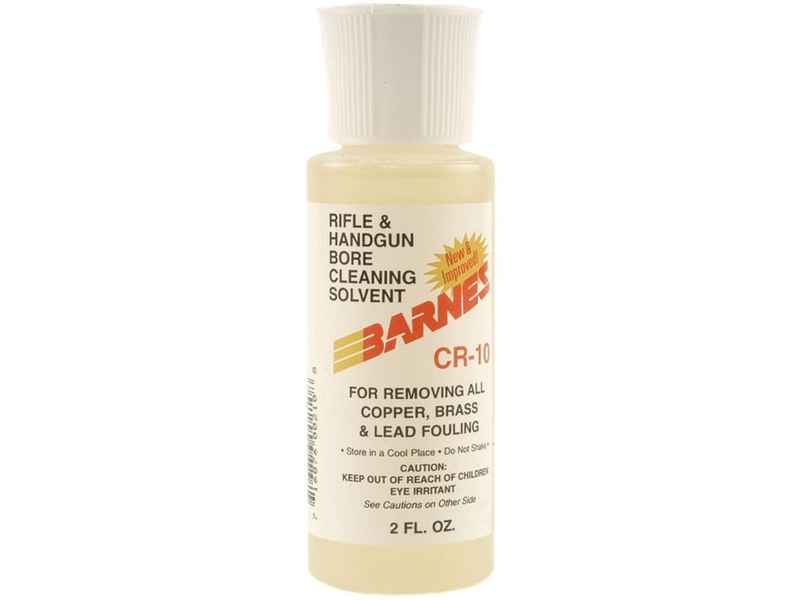 I use brake cleaner on my AR. I remove the extractor with it's rubber o ring and go to town. I only use brake cleaner on AR's, because they are filthy, crap where they eat, pigs and deserve to be treated as such. But you repeat yourself... they are ARs... what more needs be said??? It is so easy. The wait time does the work. I don't even know where my brushes are anymore. Foam it. Let it sit overnight. Run two patches. Done. If your bore is reasonably smooth, it will come out clean to the bare metal. This isn't my experience with wipeout, but what works for you, works! What kind of black demon magic is this you refer to, Sir?!? Matt, do you plug the end of the barrel, or what? Dan, I've been using M-Pro 7 on my AR but I may have to try the KG-12. I used to use Sweet's for cooper fouling many years ago, it's powerful stuff, too powerful for me. For my hunting rifles it's been Shooters for as long as I can remember, the past few years I've been using Rifledude's recipe of 50/50 Shooters/Kroil. I use a tight fitting bore guide, squirt foam through the bore guide, and plug the end of the bore guide with my finger until foam is stops flowing out the end of the barrel. Then I pull the bore guide and make sure the barrel is level and put a rag under the muzzle to catch any drips. That's it. Then the next day I push a couple of tight patches through. Amazing stuff. +1 to the Wipe Out, and if you prefer to scrub, Bore Tech Eliminator is great stuff. I have done an additional step in my rifles by treating them first with Dyna Bore Coat. Initial cleaning down to bare metal with Kroil, WO/BoreTech, and JB's or Iosso, then treat with DBC per instructions. By doing this I now never use more than 6-8 patches to get a bright, shiny bore. I also do not clean my barrels more than necessary, dictated by eroding accuracy. Usually between 125-150 rounds for hunting rifles. Wipe- Out now comes in a liquid called Patch Out, so no more funky nozzles/foam to fool with. I have no experience with it, but it sounds good. The Wipe-Out disclaimer that it eats finishes on old guns is cause for concern. Kg-12 may be the best stuff, but it has a small drawback, for me. I don't have bore guides/rod for all my rifles and have taken to using the Otis cable to pull slotted tips and brushes through instead of pushing a jag/patch. I haven't found a suitable non- brass slot tip for patches and KG-12 works over brass components right quick, but suspect that a brass slot tip will still outlast polymer or other tips, even with immediate material removal. I oil the cable brass parts and slot tip before use. ...the past few years I've been using Rifledude's recipe of 50/50 Shooters/Kroil. That sounds interesting- I'd like to know more, if someone has more info (hint Ted). Anyone tried their own homebrew, ala Ed's Red? I've mixed Kroil, Hoppe's, some household ammonia and a few drops of light oil, but not really impressed with it. You didn't get my point... you have to ensure that you the Wipeout fully coats everything in the barrel or it may leave a little behind... not a big deal. What would be left behind would be virtually insignificant. Make sure the barrel is fully coated and it appears to do all it claims.